I responded to a newsgroup post today that asked, “Is there a rate or range of rates that freelance e-Learning contractors typically charge?” It occurred to me that my “e-Learning Management 101 – Estimating, Pricing, and Running Your Business” presentation that I used to give at our e-Learning Authoring Conference could be helpful. So I put it at the URL below and thought I would do a blog post as well. How Much to Charge as a Consultant? Obviously lots of variation and factors here, but this is the general idea. A “coverage” approach that focuses on the cost of resources and estimates a project based on the percentage of time by person over a particular time frame. A “screens” approach that breaks down a CBT or WBT into the number of screens of varying complexity. How much will quantity demanded go up when we drop the price? Besides price, what affects the demand for our product? Tastes is the only one that you can normally do anything about. If customers can buy a similar product, then they will go for the lower price. Customers can eventually move to other solutions if price is too high (buy a more fuel-efficient car if gas prices go up). So more elastic with time. Most Platte Canyon products have had no existing competitor product on the market. Ask potential customers what they might be interested in paying. We did this with beta testers for L&M Instructor 6.5. Put products on sale and look at the response. Try a “Lite” and “Pro” version. If the market is big (as for training on Microsoft Office), then there are likely numerous competitors. This will constrain the price you will be able to charge. Need to research this thoroughly before setting pricing. If you are training on an expensive product (sophisticated machinery or software), then easier to command a premium for the e-Learning. When I went to help/trainingstudio/TrainingStudioContentEditor, there was no file named news.mdb or anything similar. I contacted the scan vendor (Security Metrics) and Emily evaluated the situation and came up with this explanation. I have looked into these issues and I believe that each one is flagging because we are receiving affirmative (200 OK) responses for non-existent pages. Our scanner is sending a GET request for a specific page or file that is associated with a vulnerable program (ie. Guppy). The response to that GET request is a custom error page that you have created – but that customer error page’s status code is a 200 OK. The scanner sees the 200 OK and it flags the issue. Sure enough, we had set up our site through DiscountASP.Net’s IIS tools (shown below) to show a custom error page (error.htm) if there was a missing page. So if the user put in a bogus link like http://www.plattecayon.com/cool.htm, that page would display. But unfortunately that page returned the standard 200 status code. I found this nice tool that shows you the actual status code: http://gsitecrawler.com/tools/Server-Status.aspx. When the scan looked for various rogue files, the 200 response put up red flags. My first thought was to edit the error.htm page to set the status code to 404 (missing page). I had no luck finding a way to do that though. The next best thing was to use an ASP.NET page as that had the power to change the status code programmatically. Here is the code for missingPage.aspx. The important part is Response.StatusCode = 404. The last step was to make this the custom error page for missing pages. This is done in IIS (Internet Information Services) for non-ASP.NET pages and in web.config for extensions handled by ASP.NET. 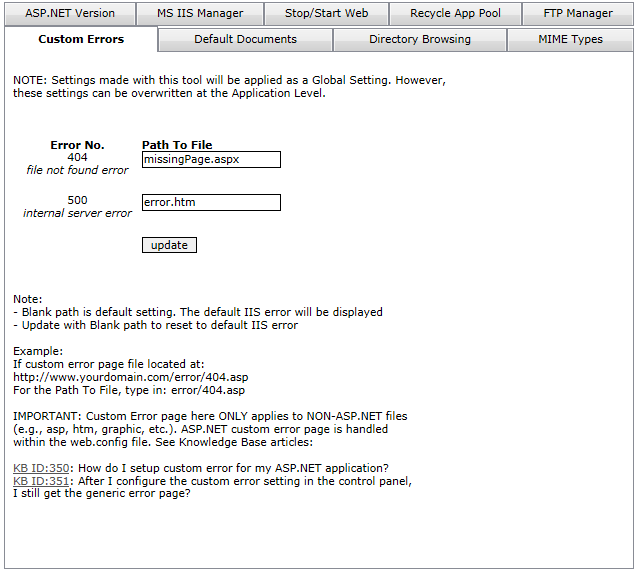 Here is the DiscountASP.Net interface for the IIS setting. After making the changes, the site passed on the first try. I hope this is helpful if any of you run into a similar situation. Note that returning the correct status code is helpful for search engines as well. I’ve run into two outstanding leadership speeches recently. The first is by General Welsh, commander of the U.S. Air Force in Europe. It is from a recent speech to the Cadet Wing at the Air Force Academy. I remember some good speeches while I was a cadet, but none as impressive as this. I particularly liked how he called everyone, even lieutenants, by their first names and gave the whole speech without any notes. Kudos to the Association of Graduates for sending out a link with the speech. The second video came via my wife Sue, who in turned got it from her boss Toby. The concept that “people don’t buy what you do but why you do it” is fascinating. There are lots of good examples and anecdotes as well. I was having lunch recently with a fellow owner of a small software business. We were discussing pricing strategy and I followed up with the list of my favorite articles related to pricing software. I have been interested in pricing theory ever since my graduate studies at the London School of Economics and even taught Microeconomics for a time the Colorado Springs campus of Regis University. When it comes to pricing your own software, it can literally be a make or break decision for your company. The first three links are from Eric Sink. I first read his “Closing the Gap” articles a number of years ago in The Best Software Writing 1 edited by Joel Spolsky. It very closely mirrored by own thoughts on how to run a business and how to sell software without the hype and the pressure that is so often used. Eric articulates his concepts and vision brilliantly. I bought the book mentioned above after reading Joel on Software for years before that. Joel has many great opinions on running a software company and other topics. His Camels and Rubber Duckies is a great article. I frequently tell our propective customers that we proudly post our prices on our site and never use the “How Much Money Have You Got” pricing that Joel picks apart in his article.